Garcinia Cambogia is a tropical fruit that is known for it’s fat blocking capability. Garcinia Cambogia Extract Pure for Natural Weight Loss is a capsule containing 1000 mg pure garcinia, 60% HCA in each serving. Garcinia Cambogia works by blocking the enzyme that converts sugar into fat. It also suppresses your appetite and eating less results in weight control, without feeling hungry. Garcinia naturally increases your serotonin levels, which is a chemical our body often considered a mood enhancer, as low serotonin levels can lead to depression. Many of us are “emotional eaters,” using foods, often high in fats and sugars, to elevate our mood and feel happier. With serotonin levels increased, you might choose to eat less! HCA is short for for hydroxycitric acid. This potent chemical is what is responsible for the benefits from Garcinia Cambogia. This product contains 60% HCA, which offers a good weight loss support. My preference is always for products made in the USA and this capsule is made in the U.S.A under the highest quality laboratory conditions following strict GMP (Good Manufacturing Practices). That speaks to the quality of this 100% natural capsule. 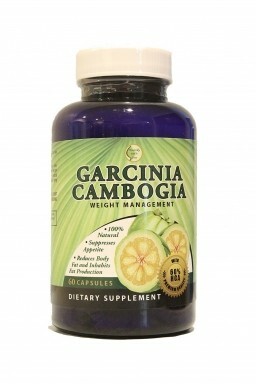 Many people have found Garcinia Cambogia to be the perfect addition to their weight loss program. Some believe that the extract itself is enough to maintain the weight they desire, but there is always benefit to adding in some exercise and ensuring that you are eating a healthy diet that is mainly plant based. With the combination of healthy eating and Garcinia, it is possible to find your healthy weight range and maintain it. I recommend this product for healthy people in pursuit of weight loss, without feeling depressed. Like any supplement, it’s always a good idea to check with your doctor if you have any health concerns.